I discovered Nia in 2001 after being a "gym rat" for decades. Spending 2 hours a day rain or shine daily. I stumbled upon a Nia class at a studio where I was taking Yoga. At first all I did was listen to the music. The sound of joyful voices filled the studio. I was intrigued by the happy sweaty faces that emerged after class. I decided to take a class and became hooked immediately. I continued taking Nia classes 5-6 days a week. I liked the changes I observed in my body, emotional state and my overall sense of well being. I learned to honor my own physical individually. Love my body. This was the first time since childhood I was able to allow myself to enjoy or experience joy! 2005 was the year I chose to take my White Belt Certification. In the year 2007 I had a hip replacement and in the process experienced many complications and became very ill. As I slowly recovered there was never an option to not dance. Thanks to the caring and supportive Nia community and my own determination I was able to recover from the series of physical and emotional challenges. As soon as I was able to use crutches, I returned to Nia classes as a student. 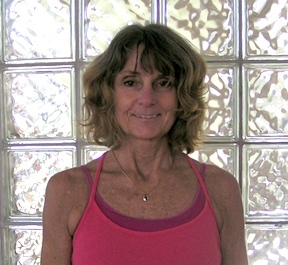 I followed the movements of the upper body while sitting in a chair during the Nia classes. My experience of 'chair Nia' was the foundation for my continued recovery. I began teaching Nia in 2008. I am proud to announce that as of November 2009 I chose to take my Blue Belt Certification. From a personal view, I truly have experienced how Nia can be an avenue for personal growth and healing even during the most challenging situations. I continue on a journey of self healing for myself and as a teacher I seek to share the benefit tools of what Nia has given to me.